On a visit to Madrid years ago, I walked inside a Loewe shop and picked up and sprayed a perfume tester. A human shark, made up in the crudely hyper-theatrical style of an amateur touring production of Carmen, ran across the store and grabbed the bottle from my hands. She snapped: "Ask if you want to smell!" as she held the bottle protectively to her breast. My traveling companion looked at me with pity. I imagined him thinking: "Poor Kevin...to be reprimanded in public." I did not say a word. I did not smile. I turned and walked out of the shop. Last week, Now Smell This's Jessica sent me a sample of Loewe 001 Man1 and suggested we do back-to-back reviews of the 001 Man and 001 Woman scents. I immediately saw red (and Señora Grosería). I felt I needed to preface my review with this story in fairness to everyone involved. Loewe 001 Man (and 001 Woman) are the brand's first perfumes under the creative direction of designer Jonathan Anderson. 001 Man lacks the heaviness and leaden quality most of the Loewe's men's line possesses (or did, I've not smelled a Loewe perfume in over a decade). Loewe's offerings were always too dense for me; their weightiness was like a hammer to my forehead that gave me pounding headaches and made me realize I could go without wearing perfume (if Loewe's perfumes were my only choices). Loewe's colognes were ordinary, but more so. 001 Man is a trifle. It begins well enough with tangy mandarin and bergamot (with a sweaty edge); the opening would make an enjoyable Eau de Cologne for summertime (it has a brand-new-white-linen-shirt vibe). Next up is a puff of light sandalwood-cypress, then things go wonky. 001 Man's base is awkward, with fleeting aromas of herbal salad dressing, pickles, powdery violet and white musk. The extreme dry down is very light: woody with a touch of vetiver. Except for the too-sweet white musk, everything fades away quickly. If Loewe had exaggerated the weird elements, fortified the formula, nixed the violet and white musk, 001 Man could have been fun. 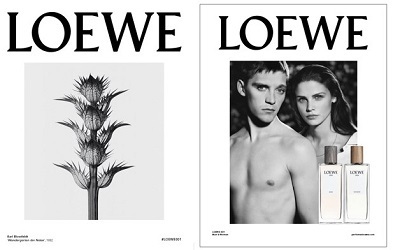 Instead, Loewe opted for a "mincing" tone. Tomorrow, Jessica will tell us if Loewe 001 Woman has more gumption. 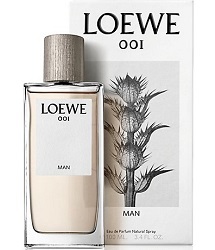 Loewe 001 Man Eau de Parfum is available in 50 ml ($90) and 100 ml ($123). 1. Listed notes of bergamot, mandarin, cardamom, sandalwood, vetiver, cypress, ambrette seeds, violet, white musk and patchouli. Love your reviews, Kevin even if (like in this case) I have absolutely no interest in the scent. I haven’t smelled many Loewe’s but none have made a favorable impression except Esencia Loewe which smells like the biggest gold medallion resting on the hairiest bare chest in a 1978 fern bar. I almost bought a bottle. That prickly plant seems an odd choice for a cologne, though true to your experience. I’m not looking forward to the flankers: What Was I Thinking and Oh, To Be Anywhere But Here. PS: Look at their faces! Hahaha! Early entry for Prix Eau Faux (sp?). There should really be a non fiction category. It gets harder and harder every year to outdo the real thing! Noz’ excellent flankers! What about Baby Loewe? Pink and Blue editions, of course! Orl, never smelled the 7 scent…was the apple note very noticeable? Kevin, thank you for injecting humor into my day! I’m glad the perfume was so mediocre, given the quality of their SAs. Koyel…ha! Read below for more Loewe SA humor. Loewe SA’s seem to be clueless about perfume. I saw the Colección Un Paseo por Madrid at Cortes Ingeles in Milaga. When I was in Barcelona the next day, I stopped by the Loewe store and asked about. The SA said there was no such thing. I showed her the picture I took of the collection and she said they were fake. I laughed at her and walked out. I found Cortes Ingeles in Barcelona and they had the full collection there. I only kick myself because I bought a bottle there rather than waiting for Harrods London. With the Euro/Pound being so weak right now, I would have saved $60 buying it in London rather than Barcelona. Back to the perfumes.. you can skip the mainstream Loewe line – there are too many and they seem to be quite basic/uninteresting. The Colección Un Paseo por Madrid is far superior – reminiscent of the first batch of Tom Ford Private Blends. Djron…curious, which one did you buy? Hmm, I shall be in Malaga in a few weeks’ time. And these are in the main Corte Ingles off the Avenida de Andalucia I guess? Any favourites stand out for you?